A German national, Horst Wallrabe has lived in Charlottesville, VA for nearly 21 years with his wife of 56 years. Prior to retirement, Horst spent his career working in international business management. He spent the majority of his career working for the Bayer organization in various markets including at the German headquarters, South Africa, the United Kingdom and the United States. 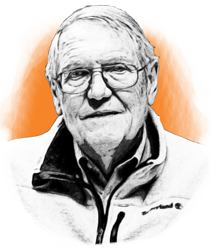 After retirement at the age of 60, Horst began taking courses at the University of Virginia through its Community Scholars Program, then later did informal graduate studies. He currently serves as a full-time volunteer staff researcher in UVA's biology department and at the UVA's Keck Center for Cellular Imaging.